When the economic crisis hit and the real estate sector was in full panic mode, Havland sought solace from the endless negativity surrounding her. "Everyone was living in fear then," she says. "There was little positivity out there, especially on TV." So Havland set out to develop a plan to make positive stories heard and, armed with the little video production experience she had learned while doing it as a hobby for marketing purposes, hopefully provide an uplifting alternative to reality television. 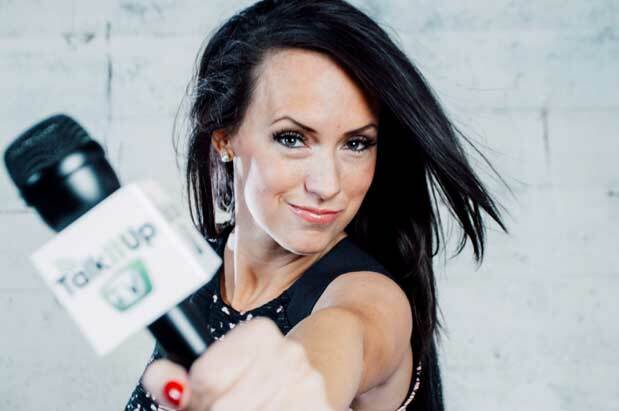 She started Talk It Up TV in 2011, a web series she produced and hosted (while still operating her mortgage business) that was devoted to telling the stories of people in need. "There was just a pivotal point in my life when I looked around at my nice house and all the success I had had and thought I should help people," Havland says. "If somebody won't do something then maybe it should be me." Two years later Havland opted to focus on Talk It Up full time. She sold her house, her business, moved to Seattle and in 2014 was accepted to a Los Angeles-based TV host bootcamp taught by talent manager and casting director Marki Costello. (Costello has coached noted celebs such as Jason Kennedy, Khloe Kardashian and Kelly Osbourne.) Havland spent months learning the ins and outs of being in front of a camera. "Marki liked me, but she told me to give up the positive branding," Havland says. "She told me that nobody wants a show like this and that I was wasting my money. Producers want a shock factor, but why does that shock factor have to be negative?" Havland refused to abandon her uplifting message. Since its inception, Talk It Up TV, which posts a new episode every third Monday of the month, has acquired droves of fans who are inspired by its message and the surprise shocking act of kindness the show's subject receives. (The act of kindness is Havland's much happier version of that reality TV "shock factor.") The show has fed the hungry, teamed up with Seahawks player Richard Sherman to help deserving kids and in the episode below, surprised a hate-crime victim with a visit from his family and donations to help pay medical expenses and rent from missed work. In July 2013, Havland launched the Talk It Up TV Life Improvement Project, a contest in which viewers could submit their stories. One deserving entry would receive a $1,000 prize. Havland and her team pored over the submissions and eventually selected dog rescuer Thayne Hamilton, who runs Grey Muzzle Rescue on Orcas Island. Hamilton and his late wife Chris started Grey Muzzle 10 years ago with the goal to care for unadoptable dogs--blind, deaf, horribly abused--from all over the country. In the episode, Havland presents Hamilton with $1,000 and surprises him with even more: donated pet supplies and treats from local businesses, legal guidance to turn Grey Muzzle officially into a nonprofit and a GoFundMe campaign that's raised more than $80,000 to date. The video received more than 1.1 million views on YouTube. "We are just flabbergasted," Hamilton recently wrote on the GoFundMe page. "Thanks again for the incredible generosity and kindness [you've] shown us since this started." "My goal with Talk It Up TV was to build an audience and prove the naysayers wrong," Havland says. And she's done just that. This past October, her brainchild received its nonprofit status, which allowed Havland to appoint a board of directors and receive tax-deductable contributions--a welcome change since Havland relied only on her own savings to fund the web series' production and any monetary awards she handed out. And she jokes, "my mother was worried about me not actually making any money." On Thursday, April 30, the Talk It Up Foundation will host its first-ever charitable gala, Night of the Stars at the Experience Music Project. And the proprietress of surprises has quite a few up her sleeve for the star-studded evening, including a well-known musician who's flying in just for the event and will be the closing act. True to form, Havland remains mum on mystery celeb. There will also be a dessert dash designed to "get people active and participating." An array of desserts will be on display and the tables that raise the most money will have first dibs to dash for the one they want. "Who knows," Havland says, "there might be some burnt cookies as an option so you've got to make sure you raise more than other tables!" For more information and to get tickets to the Night of the Stars Launch Party and Charitable Gala, visit the website.